A 30-minute, 5 ingredient dish sounds just about right these days. You won’t believe how easy this recipe is, but how much flavor it has! I used fresh lemongrass and canned coconut as the major flavor ingredients, and then organic, pasture-raised chicken tenders for the protein. 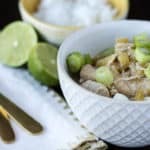 For my keto friends, this recipe is absolute perfection (see the video for how to make this Instant Pot Coconut Chicken at the end of this post). 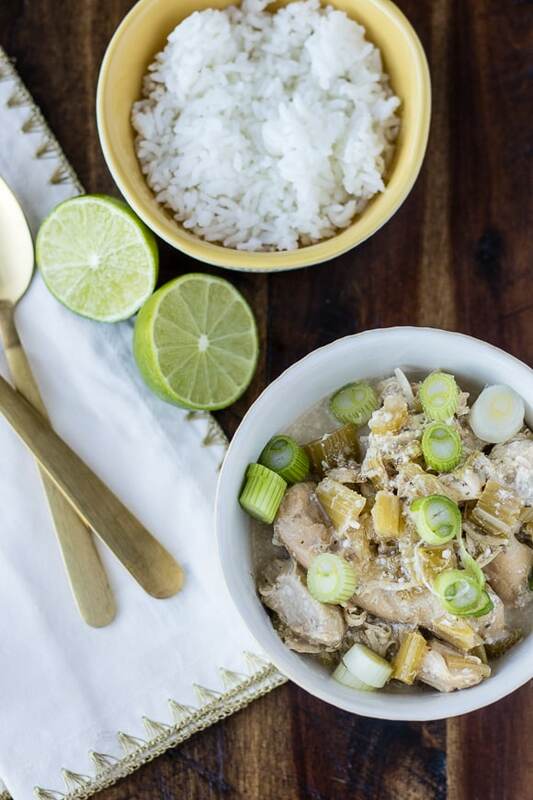 All you have to do is add the celery, chicken, lemongrass, and broth to the Instant Pot, and then cook it for 22 minutes. Use the quick-release and then stir in the coconut milk. That’s it! 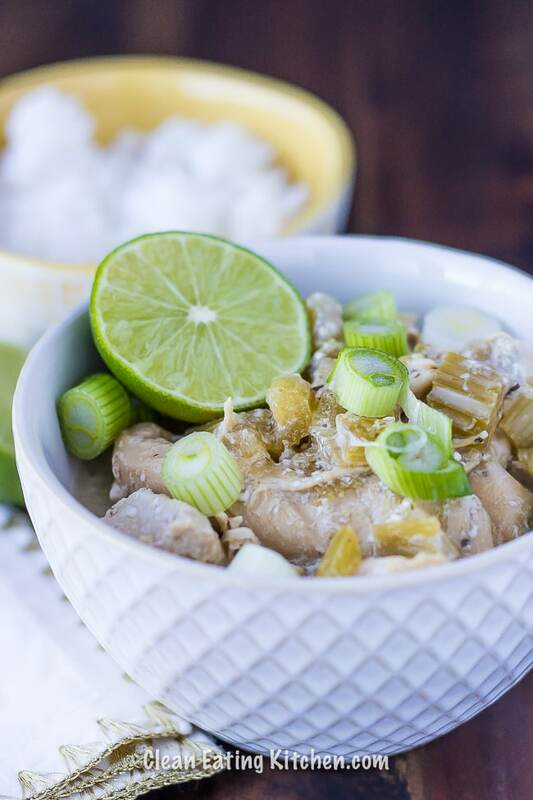 I recommend serving this Instant Pot Coconut Chicken with cooked rice or cauliflower rice, scallions, and a squeeze of fresh lime for a satisfying and flavorful meal. If you don’t like celery, then feel free to substitute carrots or another similar vegetable instead (fennel, onions, and bell peppers would all work okay too). But, in the interest of keeping this recipe to just a few ingredients, I used celery. You don’t have to serve the soup with rice, scallions, or lime, but it rounds out the meal, in my humble opinion. 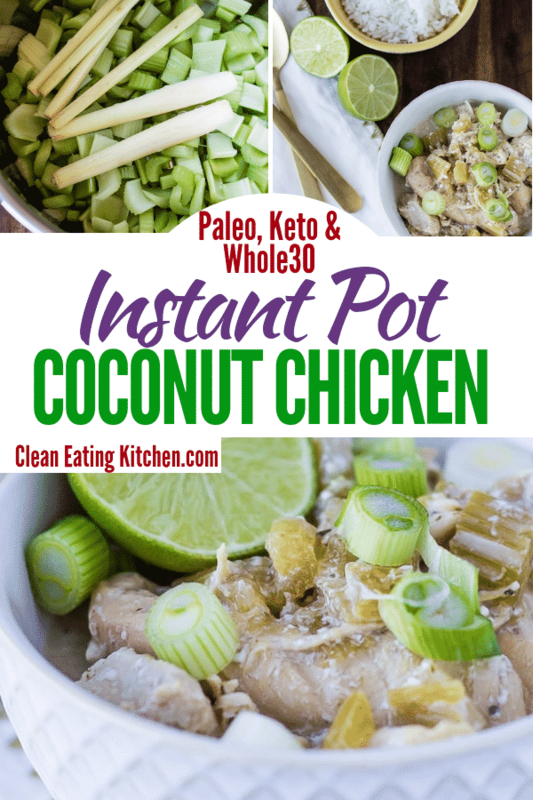 Here’s the printable recipe for my Instant Pot Coconut Chicken. Enjoy!!! A 30-minute meal full of flavor and nutrition. 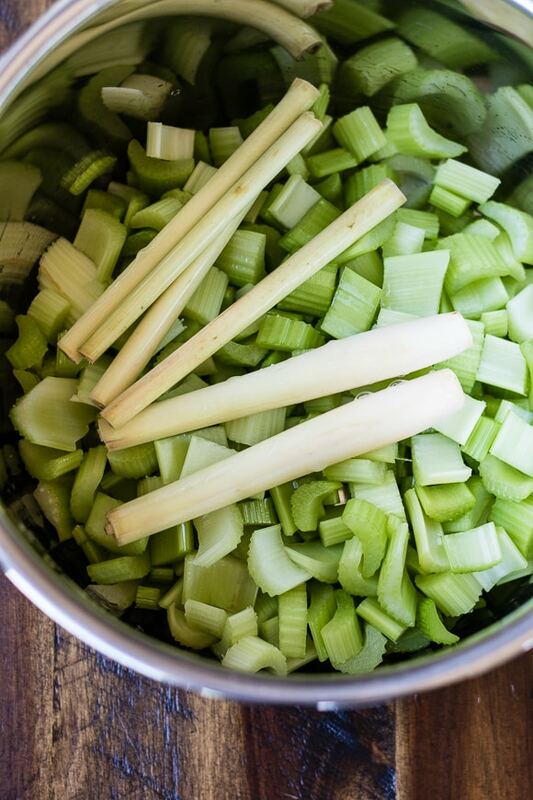 Add the celery to the pot of your pressure cooker. Place the chicken tenders on top of the celery. Add the chicken broth and lemongrass and lock on the Instant Pot lid. Cook on high pressure for 22 minutes and use the quick release to let off the steam. Use tongs to remove the lemongrass and discard. Pour in the coconut milk and give the soup a good stir. Season with salt and pepper, to taste. Serve with cooked rice or cauliflower rice, fresh lime, and sliced scallions, if desired. Here’s a how-to video for how to make this Instant Pot Coconut Chicken Soup! Such an easy weeknight meal! Perfect partner with rice. Looks yummy! Went to purchase lemon grass for this dish. Couldn’t believe how expensive one stalk of lemon grass was. Is there an alternative to use instead of the lemon grass that”s not so expensive? You can use fresh lime juice instead and leave out the lemongrass completely. Just squeeze one fresh lime at the end before serving. I know! Went to an Asian market instead and got a whole bunch of long stalks of lemongrass for $1! So much cheaper! Wow , celery, chicken, lemongrass and coconut milk … I can well imagine the flavours and aroma. I shall be cooking this soon .Thanks for the great and easy recipe. Coconut and chicken? What a great combo! Looks so delicious! 30 minute meal? Count me in! It looks SO good! We love dishes with coconuts milk here. This is definitely on my list, looks so good! Instapots are all a craze nowadays. My friend just bought one and I got to taste the ribs she made with it. She is looking for more recipes so I will gladly share your post! Healthy and delicious, my kind of dish! Love that you put coconut milk, yum! An instant pot is on my list of things I would like to have for my kitchen. I love trying out news ways of cooking chicken. This dish looks quite tasty! This looks so good, and I can probably get away with using my crockpot (I think I just need to adjust the timing). Unfortunately, this was not worth the trouble and I notice none of the other reviewers appears to have made the dish. It needs a lot of seasoning and garnishes to make it acceptable and I feel like I could have gotten a lemongrass flavored chicken stock pretty easily without going through all the bother. Think of this recipe as a starting point, not the desired result. I realized after making this that most of the reviewers had not actually made the dish. First it was incredibly bland. Like REALLY REALLY tasteless. Pouring the coconut milk over at the very end without any further cooking does not actually impart the coconut flavor into the sad, pale chicken. Secondly, without thickener or further cooking of the 1 cup of coconut milk, it was like a very thin soup. But really less like a soup and more like bland boiled chicken bobbing around in coconut milk. Flavors didn’t integrate. This is a good idea for a rough starting point, but not there yet.